I find it very rewarding imaging the milky way, getting out to a dark site and seeing the bright stars. You can often see the faint cloudiness of the milky way, but bringing it out with the camera and seeing the core looks spectacular. One of the more frequent questions I get (apart from what settings) is how to find the milky way. The milky way is viewable every night of the year, but the milky way core is the part most associated with it. The core is the more interesting part of the milky way with the bright centre and prominent dust lanes. Skysafari to advise me where the milky way will be – I like this app (on IOS and android) because I can expand the field of view to whatever the vertical length is for my lens. So shooting using a 15mm lens on my full frame Canon 6d is 100 degrees. From that – I can tell based on the horizon and time/date what the milky way will be like. Since I do a lot of panoramas – it’s useful to know as well for the composition because I want to have sufficient foreground overlay. Photo pills – a more recent app to my took kit. At the time of writing it’s only available on IOS. Photo pills has a good range of tools available from showing the milkyway arch to moon phases and luminosity. The most interesting tool is the augmented reality – where you can see the millkyway composed through the devices camera. The Photographers Ephemeris (TPE) – I’m not sure when they added it – but also has a milky way positioning view and also combines with light pollution. There are many any other apps available that can assist. The manual option is an astronomy star wheel (planisphere). For a computer based solution, programs like Stellarium can assist. The advantage of using a mobile/tablet app is having it out on the field to double check. Light pollution maps such as http://www.lightpollutionmap.info/ – are useful to work out where you need to go. Darker locations are off course better. What you need to consider also though is the direction of light pollution. If the milkyway core or arch (for a panorama) is pointing towards a large light pollution source – then that will impact on the image. It’s important to also check the weather conditions (especially cloud cover and wind) and moon luminosity. I use apps (such as photo pills) for the moon luminosity, but as a beginning location I have a look at a moon calendar like this one which can be customised to the month and location. This gives me a general idea of how bright the moon is and when it rises and sets. There are plenty of moon calendars around. I also use something like willy weather or apps to show moon luminosity estimates. You don’t need a new moon or moonless situation to shoot, however if it’s too bright – the milky way will be washed out by the light. I actually prefer shooting with a moon as it lights the landscape (more on this later). Time of year – Milky way season for myself in the southern hemisphere is from around February to October/November (I barely shoot in November). However early in the season it’s pre-dawn shooting with a rising milky way. Possible hazards exist if you are travelling to the location in the night. At the end of the season for us – you have longer days which starts to imped on the time available with a setting milky way. For me – the ideal milky way imaging is between May and August/September as there are options for a rising and setting milky way. The advantage is also that it’s cooler temperatures here as it includes the winter months. Cooler temperatures result in a clearer sky and also is kinder on the sensor for noise. 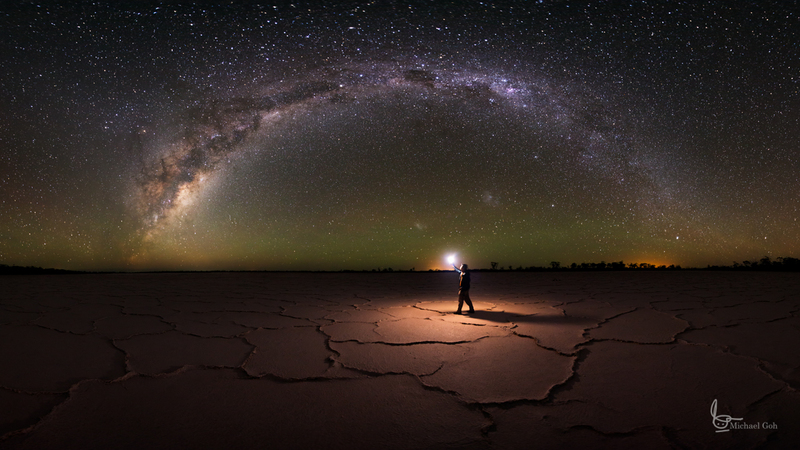 Interestingly enough – a northern hemisphere milky way looks different to the southern hemisphere. The advantage of astrophotography is that the key components can be readily planned for – in the first month of the year, I’d already planned the entire year of suitable milky way dates (subject to weather) for both the core and the moon. I’ve also planned something forward for 2-3 years for some particular conditions. The Dying Earth – planning for a rising milky way – salt lake textures are only available for a short time in the year, so a lot of planning was involved with scouting for an early season shoot.